Windows by default stores recent documents information so users can get back to the last accessed document quickly. To disable recent document list, you can just go to the Start Menu properties and uncheck "Store and display recent opened items in the Start Menu" option. But this technique will keep all types of documents from appearing. What if you need to hide a specific File Type? You can by using FileTypesMan. 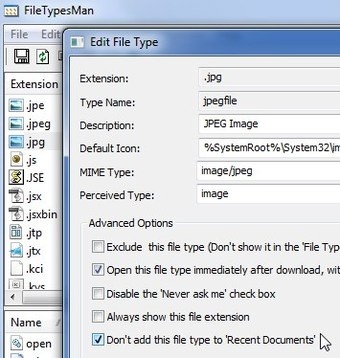 FileTypesMan is an alternative to the 'File Types' tab in the 'Folder Options' of Windows. It displays the list of all file extensions and types registered on your computer. To hide specific file types from recent documents using this tool just run this no-install-required application, browse down until you find the file extension you want to hide, double-click on it, and then tick the box for "Don't add this file type to Recent Documents" as shown below. This portable app supports any version of Windows from Windows 98 to Windows 7.